How much are your Aventura worth? Before we begin, it is important to note that CIBC Aventura "Points" and "Rewards" are the same and will be used interchangeably. Ratehub.ca’s research revealed that on average one Aventura point is worth $0.0116. However, there is a large discrepancy in the value of your points when redeeming for flights in different regions. For example, on average you receive $0.0092/point when redeeming for a flight from Toronto to Montreal, compared to $0.0135/point for a flight from Toronto to Vancouver. The examples below will demonstrate how to value your points. A. Find the price of a comparable flight on Kayak (we use this flight price because if you did not book through CIBC Aventura you would have your choice of booking through any provider). B. Look up a comparable flight on CIBC Aventura’s rewards centre on the same dates. C. Add the points required for taxes as well as the dollar value in points of exceeding the maximum ticket price, if applicable, to the general point requirement (dollar value x 100 points/dollar = number of points). D. Divide the price of a flight found on kayak by the total points required for a comparable flight to find the value of one Aventura rewards point. The example below was priced out by Ratehub.ca in 2014. When redeeming your points for a flight to Ottawa in September you receive $0.0065/point, which is poor value for your points. As you’ll see in the example below, certain flight regions provide significantly better value for your points. When redeeming your points for a flight to Los Angeles in September you receive $0.011/point, which is great value for your points. CIBC Aventura points can be redeemed to cover all aspects of travel, including taxes and fees. No, the value of your Aventura points change by flight destination/region. 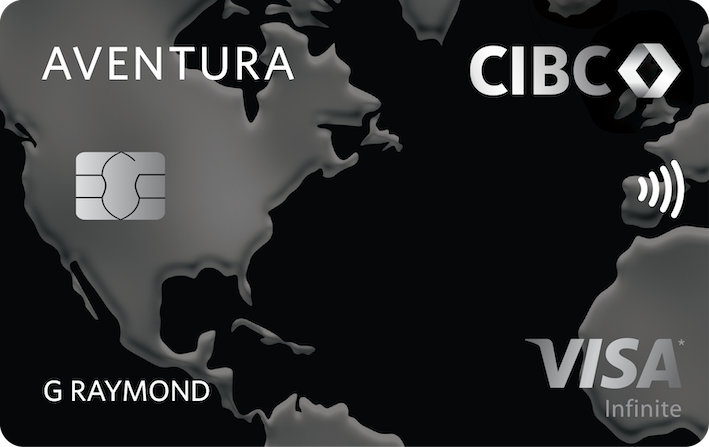 CIBC Aventura card holders who have an eligible Aventura account issued before October 1, 2013 are able to redeem Aventura points for Aeroplan miles. The exchange ratio is 1 point: 1 mile, in increments of 10,000 points. Yes, the CIBC Aventura program allows access to hundreds of airlines, however airlines are subject to availability. Popular airlines include Air Canada, Delta Airlines, Lufthansa and British Airways. No, they must be used online at CIBCrewards.com or via the call centre in advance of redeeming rewards or travel. Aventura Points do not expire as long as your account remains open. They will expire if they remain unredeemed for 60 days after you voluntarily close your Aventura credit card account, or within 12 months of the primary cardholder’s death. With the CIBC Aventura program, you are able to redeem for flights on hundreds of airlines, without blackout dates or seasonal restrictions. Moreover, the 'Aventura Flexible Travel' option gives you the option to pay for flights, vacation packages, cruises, hotels and car rentals with any combination of Aventura points and credit using your CIBC credit card. CIBC Aventura points require you to order (redeem) miles towards travel or merchandise exclusively on the CIBC website or over the phone. This lowers the flexibility of the Aventura program since it removes your ability to shop around on popular travel sites for the best deals and flights, like many other rewards programs. Unfortunately, once ordered, rewards are non-refundable, non-exchangeable and non-transferable. The CIBC Aventura program allows you to redeem points to cover all taxes, fees, and surcharges. Ratehub.ca’s research revealed that on average one Aventura point is worth $0.0116. However, there is a large discrepancy in the value of your points when redeeming for flights in different regions. To maximize the value of your points it is important to use your points strategically by flying to destinations that provide good value. The best flight regions are Long haul: Canada/US and 'Rest of the World' (Asia, Australia, Africa). To maximize the value of your points you should try to redeem your points for flights in these regions.